I had not planned on posting this salad this week...or ever, actually. 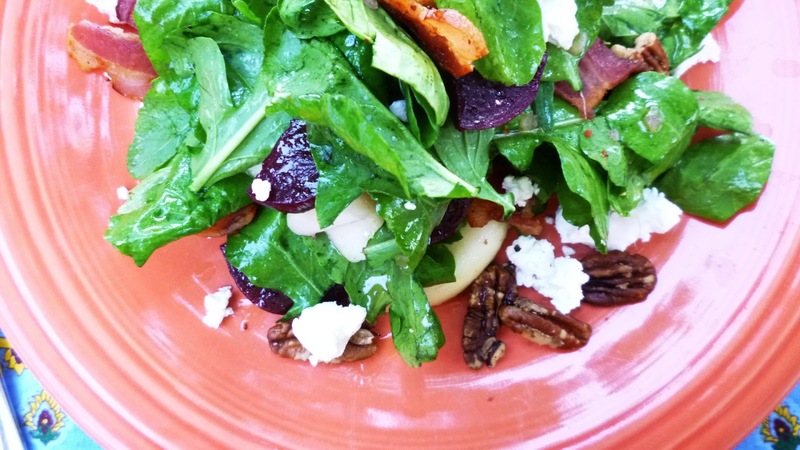 After all, salads with beets and goat cheese...or pears and blue cheese...are ubiquitous. 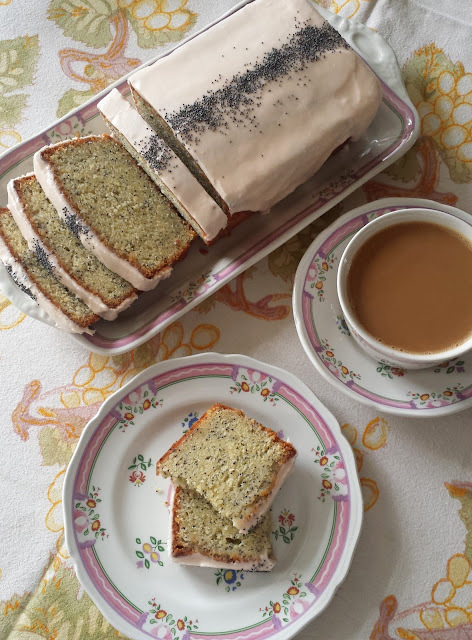 But as is almost always the case when a recipe persists in popularity over the long haul, there is usually a reason: the original was—and still can be—truly delicious. Preparing such a recipe—one that stands up to the original—is always about choosing the best ingredients...and of course, combining them with care. 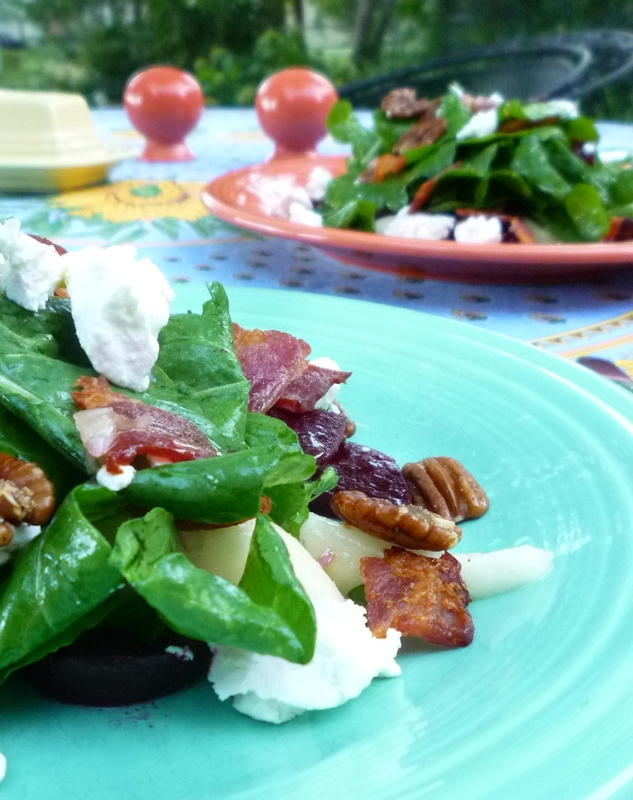 I was reminded of this as I prepared a salad of roasted beets, pears, cheese, nuts and bacon—a combination of these two aforementioned salads—over the weekend for some dinner clients. The beets were sweet...the pears were perfectly ripe and juicy....and both were set off to perfection by the spicy-sweet pecans, crispy bacon and pungent blue cheese. It looked so good to me that I prepared it for dinner at my house the next night. I didn't happen to have any blue cheese on hand...but I did have some nice goat cheese, which made a more than adequate stand in. This particular salad is from Frank Stitt's Southern Table, and his fondness for the ingredients of his native south is on full display. Where some add olives for a salty counterpoint to the sweetness of the beets, he adds bacon...which also happens to go beautifully with the pears (and blue cheese). And in lieu of the more commonly chosen walnuts, he uses pecans...all dressed up with sugar and spice. I find his variations to be inspired. And judging from my clients' enthusiastic enjoyment, so did they. I think you will too. Right now...while beets and pears are in season...is the perfect time to give it a try. Render the bacon until crisp...set aside. When ready to serve the salad, quarter and core the pears. Cut each quarter into thin wedges (about the same thickness as the beet wedges) and toss with a small amount of the vinaigrette. In a similar manner, dress the beets with a small amount of the vinaigrette. Place the arugula in a large bowl, season with salt and pepper and drizzle with just enough of the vinaigrette to lightly coat. Toss well. Arrange half to two-thirds of the beets, pears, bacon, pecans and cheese on the plates. Divide the arugula among the plates. 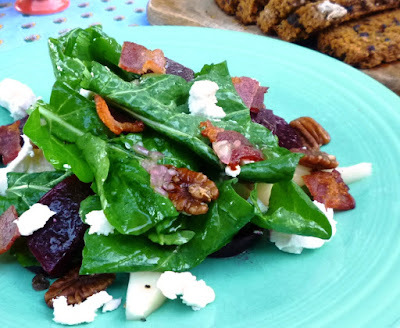 Arrange the remaining beets, pears, bacon, pecans and cheese attractively over the greens (some on top and some nestled in among the lettuces). Serves 6. In a small bowl, combine the vinegar and shallot. Season to taste with salt & pepper and set aside for a few moments to allow the shallot to soften. Gradually whisk in the oil, adding it in a thin stream. Taste and correct the seasoning and the vinegar balance.